With over 200 million cases and 600,000 deaths every year, malaria is one of the world’s greatest problems. The high number of deaths is a result of patients only receiving antimalarial drugs once their infection burden is too high for the treatment to be effective, coupled with the fact that more drug resistance strains are developing all the time. 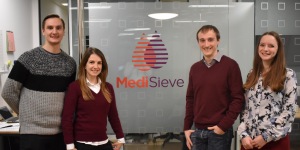 MediSieve provides one solution, its uses a magnetic sieve to physically remove Malaria infected blood cells directly from a patient’s blood. The device has the potential to reduce a child’s infection burden by 90% in only 3.5 hours. Treatment is similar to dialysis in that the blood is continuously circulated through a magnetic filter via an external loop. Infected red blood cells are captured in the filter due to their naturally magnetic properties and healthy cells are returned to the patient. The MediSieve can be used in conjunction with drug treatments against all strains of malaria even drug resistance strains. MediSieve initial focus has been on the treatment of Malaria but it is also developing technology to treat leukaemia and sepsis. Treatment of these diseases requires the development of MediSieve particles. MediSieve particles are magnetic particles coated with antibodies to target specific components in the blood. The blood can then be filtered via an external loop in the same way that can be used to treat Malaria. In leukaemia the particles target white blood cells. The high number of circulating white blood cells in the blood can prevent chemotherapy being effective. A multi target approach is used to treat sepsis. The system can remove pathogens, endotoxins, and cytokines to tackle the root cause of the disease and prevent disease escalation. Clinical trials of the Filter are planned for 2018, while first clinical trials of the MediSieve Particles are expected in 2020.